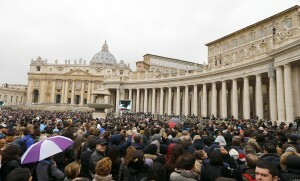 Starting Feb. 16, the Vatican will offer free shaves and haircuts to the homeless every Monday in St. Peter’s Square. The project is being spearheaded by Pope Francis’ almoner, Konrad Krajewski, who was inspired by a homeless man named Franco. Franco was invited to dine with the bishop but declined, saying he smelled. Later, over Chinese food, he explained to Krajewski that although he could find a sandwich every day, Rome lacked a place to use the toilet and wash. The idea to provide these services solidified when a plan to install toilets and showers in a renovated area of the plaza formed in 2014. Now that it is almost open to the public, the grooming services will be supported by donations. In fact, according to The Guardian, many razors, scissors, mirrors and chairs have already been contributed to the Catholic Church’s government, the Holy See. Left: Pope Francis waves during his Sunday Angelus prayer in Saint Peter's Square at the Vatican, Jan. 11, 2015. Photo by REUTERS/Stefano Rellandini.